I just blended 1 part kumquat and 1 part peach into a soy candle, and it smells so yummy! I love it! It’s the best blend I’ve made so far. Yummy!!! I was already planning on placing an order today, and kumquat has now jumped on the list. Last order, I tried Wasabi, Rhubarb, and Red Lychee Tea….these are definite winners and it sounds like this one will be too! I never could get used to eating kumquats. :} I’m sure I’ll like the scent better than eating the fruit. 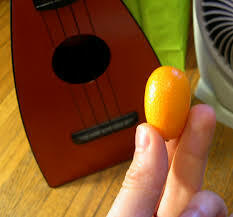 Got my Kumquat last week… can’t wait to try it by itself and maybe with some of your blending ideas. Thanks. I have a little folder with all of the fab. blending ideas that come with my BB orders. Anytime I’m stuck for inspiration, I run for the folder. I can’t wait to try these blends. Kumquat is my new fav! I can’t walk by the bottle without taking a little sniff. (is that wrong?) Thanks for all of the yummy ideas! ok weird – Paula Deen used Kumquats as a garnish yesterday AM in an episode, I went to the store in the PM and for the first time ever I see Kumquats in the produce section, a huge lot of them. Then today I read your blog and low and behold you mention Kumquats! To strange. So they’re orangey and are they any good?? Since you mentioned them, I just HAD to ask! THANX!